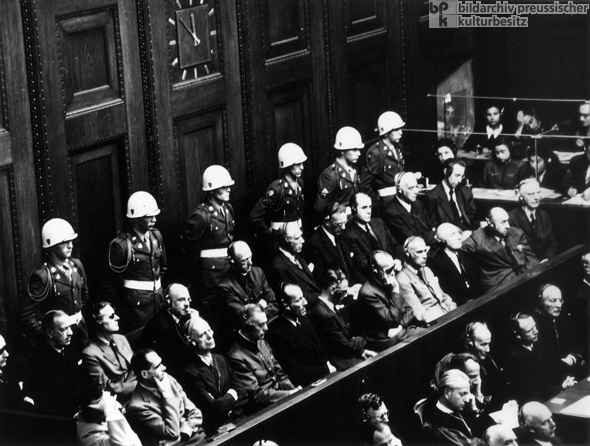 At the Nuremberg Trial (November 14, 1945-October 1, 1946), the leadership of the Nazi party, the Gestapo, the SS, the SD, and the SA were declared criminal organizations. Twelve of the highest functionaries of the Third Reich, including Hermann Göring, Joachim von Ribbentrop, Alfred Rosenberg, and Wilhelm Keitel, were condemned by Allied judges to death by hanging; others were given long prison sentences. Because the courtroom was very brightly lit for the filming of the trial, the accused were given dark glasses. The photograph below shows the 21 defendants. Front row (from left to right): Göring, Rudolf Heß, Ribbentrop, Keitel, Ernst Kaltenbrunner, Rosenberg, Hans Frank, Wilhelm Frick, Julius Streicher, Walter Funk, and Hjalmar Schacht. Back row (from left to right): Karl Dönitz, Erich Raeder, Baldur von Schirach, Fritz Sauckel, Alfred Jodl, Franz von Papen, Arthur Seyß-Inquart, Albert Speer, Konstantin von Neurath, and Hans Fritzsche. Seated in front of the accused are some of the counsel for the defense. Photographer unknown.